L’association locale ODRINO lance un appel d’offres local pour la sélection d’un cabinet d’expertise comptable qui aura en charge l’audit des procédures administratives et financières du bureau en Haïti (Port-de-Paix). le jeudi 11 octobre 2018 à 14 heures. Une société sera choisie par une analyse qualitative et financière des offres. 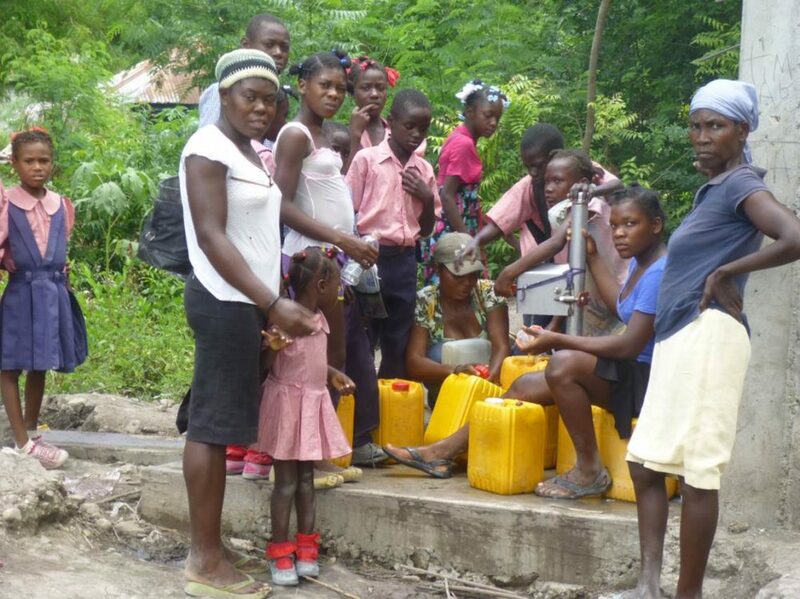 On October 4th 2016, Hurricane Matthew hit Haiti and damaged the spring fed water system at Source D’Esperance (Source of Hope). The Source D’Esperance spring is underneath the big white scar in the mountain. Members from the Lacoma church found the ends of the broken pipes and repaired the waterline restoring water to their community. But only two weeks later, flooding from the storm widened a nearby river to where the pipes were buried. It washed out the repairs and did extensive damage to the water system. 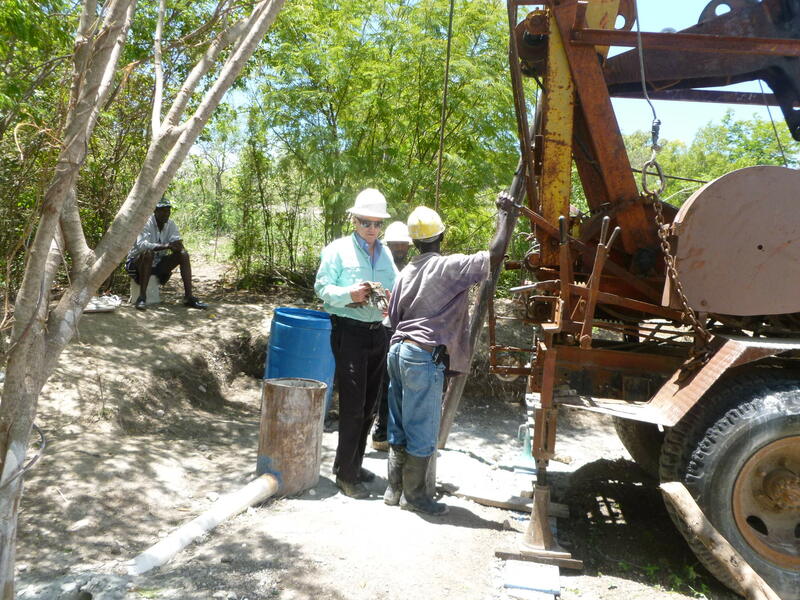 Church members seen here are trying to find the end of the pipe near the spring to reconnect it. the previous repair efforts were the first place to look. What they found was that the river had ripped away fifty pieces of pipe (over 1000′) from the pipeline and that repairs were impossible. The river had widened to the area where the pipe was buried washed away the pipe and several feet of soil that the pipe was buried in. The pipeline would have to be rerouted. Another and equally large problem was the damage to the spring cap. The water was now coming out from underneath what was left of the concrete cap. It would need to be removed and rebuilt so as to withstand water fifteen feet deep coming over it as well as withstanding four foot diameter boulders smashing into it as they rolled down the river during flooding. These boulders have to be broken up and removed by hand to so the pipeline can go through here. below the surface shown this picture and encased in concrete. The rock in the center of the picture is held in place by the little round rock underneath. To keep this rock from rolling out and further blocking the path of the pipeline we had to make a masonry base around this rock to keep if from rolling. Earth tremors are common in this area and we will have men working close by with jackhammers causing a lot of vibration. Volunteers from church and community dug through the boulder field to replace the pipeline that had been washed away. They dug the trench as much as they could uncovering the boulders so the rock breaking crew could come behind and break the boulders up and remove them. In some cases they can make the pipe pass in the space under the rocks and leave rocks in place. Further downstream of the spring, for the pipe rerouting to work, the pipe has to be dug twelve feet deep through another boulder field and then surrounded by reinforced concrete. That trench was also completely dug by volunteer labor organized by the churches in the area. However the rock removal and concrete work is being done by an experienced crew from ODRINO. Rocks are broken using an electric jackhammer, drilled holes and wedges and slips and 12 pound sledge hammers until the pieces are small enough to be removed by hand. The wedges are used in granite quarrys but the rock here is just a bit softer than granite meaning we had to drill more holes and use a bigger hammer and abuse the wedges and slips some to break the rock. The rock is kaolinite and it is ground up and sometimes used in toothpaste. It’s also known to be good for soothing an upset stomach and the treatment of diarrhea; the most common of these was kaopectate, which later abandoned the use of kaolin. The geologist who identified the specimen we sent identified this rock by licking it. 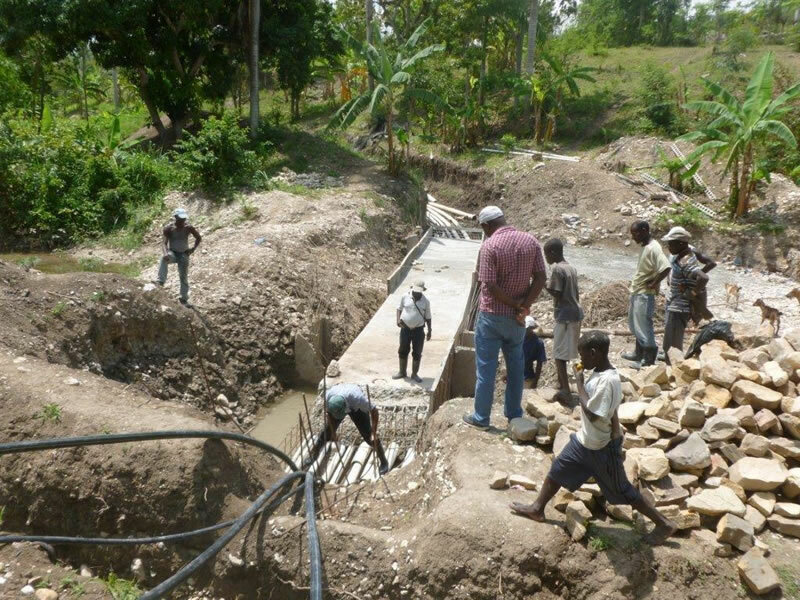 At this writing, we are moving well on the pipe laying and rock removal; much faster than thought possible thanks to overwhelming community participation. All the pipe ODRINO had available has been used and we are waiting for a boat from Florida with the next shipment of pipe. After many delays it has gotten approval to sail. We are also waiting for the roofing tin for roofs damaged in the hurricane winds. 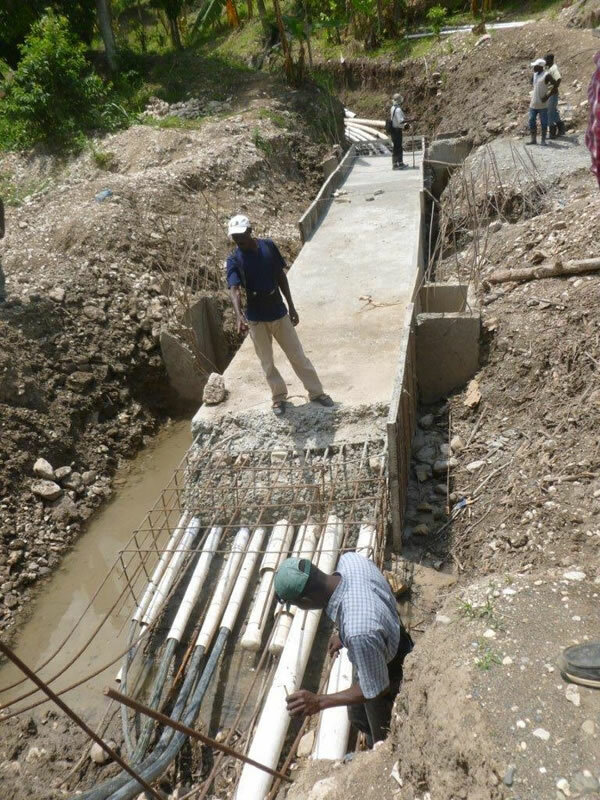 After being slowed down by torrential rains in May, the river crossing was completed in June. 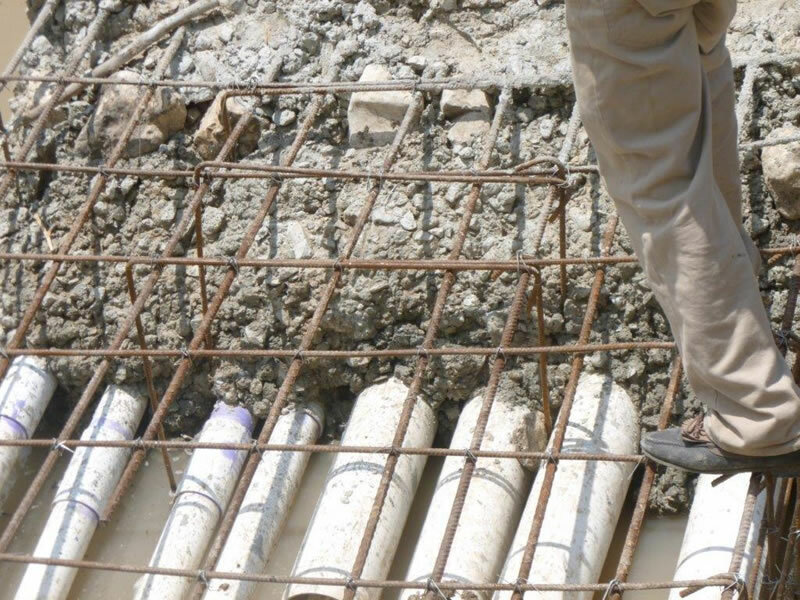 The concrete encased pipes are built as a concrete beam when crossing the river and is supported by concrete pillars set in the river that serve as caissons. A water system can cost hundred of thousands of dollars and needs to be built to survive hurricanes and earthquakes. Locally produced gravel and concrete are used with proven construction techniques for these conditions.